This is an adjustable wind-deflector type roof spoiler designed for Tamiya's 1/14 scale radio controlled Tractor Trucks. The realistic Roof Spoiler not only enhances appearance but is also functional as seen on full-sized trucks. 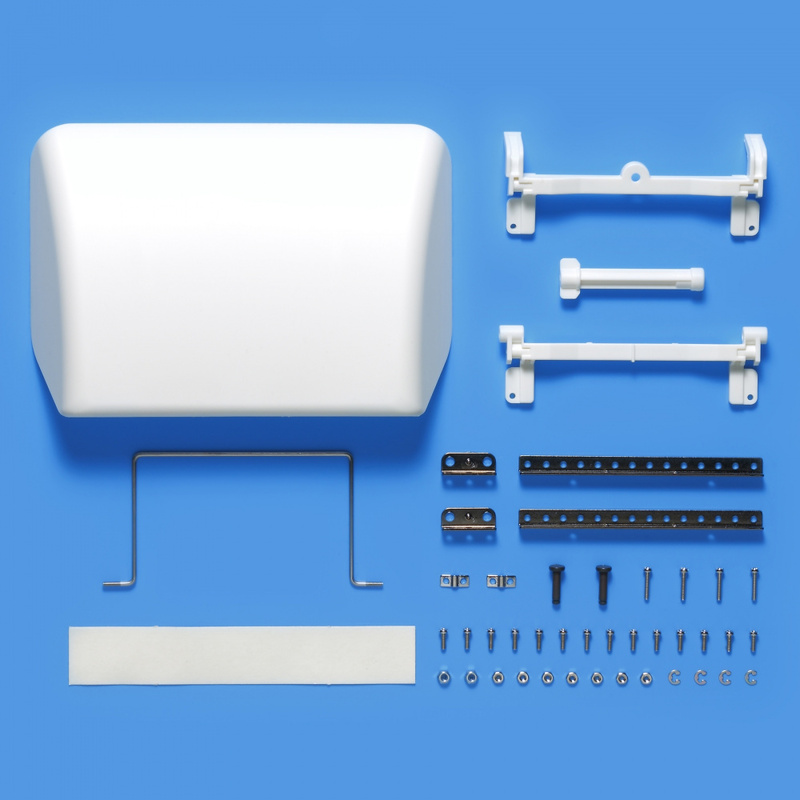 The Roof Spoiler can be mounted easily using double-sided tape or screws included in the set. Vital components such as spoiler-rails and spoiler-rod use metal parts to attain necessary strength while the deflector panel and cross-member is injection molded for scale appearance. Spoiler angle can be easily adjusted between 30 - 90 degrees allowing you to select the desired angle. • Realistic injection molded roof spoiler comes in white (Item 56504 is black). • Can be mounted easily using double-sided tape or screws included in the set. • Spoiler rod and rails are metal parts. • Deflector and cross-member parts are injection molded. • Spoiler angle can be easily adjusted between 30 and 90 degrees. • Compatible with King Hauler (Item 56301, etc. ), Globe Liner (Item 56304) and Grand Hauler (Item 56344, etc.) models.